This 166 page (A4) book is a follow up to Helen Robinson’s highly successful history of Wynberg “Beyond The City Limits” (currently out of print) which covers the founding of the village in 1795 until 1927. “Wynberg – A Special Place” deals with more recent times from about 1900 to the present day. Those that grew up in the village of Wynberg will know every name, street and building to which the author refers. 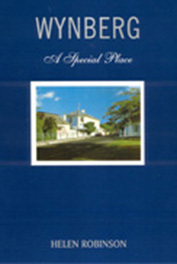 Almost every page contains photographs of old Wynberg and its people, its schools and its businesses. Many will recall Duncan Taylor’s, McDonald’s Outfitters, Cogill’s Hotel, Rifkin & Miller of “Everything from a needle to an Anchor” fame, Braam’s Butchery, the Curzon, Capitol and Regal Cinemas and of course Jack Perrow’s Garage at the bottom of Carr Hill. They are all between the pages. Helen Robinson has researched this book in her usual meticulous fashion and has produced an outstanding work. A ‘must-have’ for any ex resident or for the collector who specialises in the history of the Cape. 166 A4 Pages. Available in printed format only.